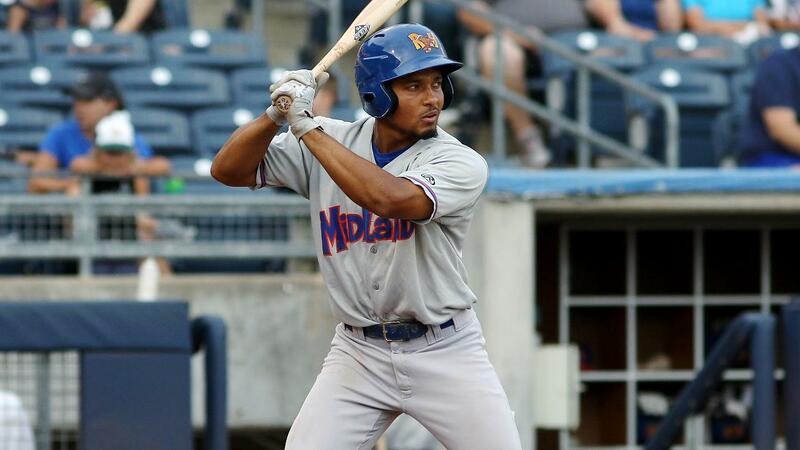 With only two games left in the Texas League season, Richie Martin is making sure he finishes strongly. The A's No. 12 prospect collected four hits for the second time in three games, tripling and scoring three runs in Double-A Midland's rain-shortened 14-5 thumping of Frisco on Saturday at Security Bank Ballpark. The Detroit native notched all of his hits in the first four innings, singling to center field in the first, ripping a triple to right in the second, poking another single to left in the third and reaching on an infield single in the fourth. Martin raised his average six points to .298 and his OPS to .802. The University of Florida product is hitting .461 with three homers and 10 RBIs over his last 11 games. Selected in the first round of the 2015 Draft, Martin posted a .234/.311/.332 slash line in 109 games between Class A Advanced Stockton and Midland last season following a .235/.327/.322 campaign with the Ports in 2016. "I worked a lot in the offseason and really did things with intent," Martin told the Midland Reporter-Telegram in June. "I put a lot of work in, my dad helped a lot, just a lot of different things. I think the big thing is just putting myself in a good position to hit. I'm getting in a good spot to hit. I want to get into that spot and let whatever happens after that, happen." Martin missed Spring Training and the first two weeks this season due a lower back strain. But he's bounced back to put together the best campaign of his four-year career. Seth Brown went 4-for-5 with a pair of doubles and four RBIs for the RockHounds, while J.P. Sportman contributed four hits and three RBIs. Midland totaled 23 hits, with A's No. 20 prospect Tyler Ramirez collecting three, including two doubles. Luis Mendez was 2-for-3 with a three-run homer for the RoughRiders.